It’s almost that time of year again. The Macy’s Thanksgiving Day Parade, on of the largest celebrations in the country, will take place once again here in Manhattan. Whether you’re watching the show from any of the NYC apartment rentals lining the parade route or standing on the sidewalk, there’s nothing quite like the floats and balloons that Macy’s features. Since the festivities are a way off yet, why not learn a little Macy’s Day Parade trivia in the meantime? Here are some strange, bizarre, and little-known facts about one of New York’s biggest events. Believe it or not, the Macy’s parade didn’t start out as a Thanksgiving celebration. Its roots dig back to 1924 when hundreds of department store employees came together for a Christmas celebration at the flagship store in Manhattan. It didn’t take long for them to change the date, realizing that they would be the only company to host a Thanksgiving parade at the time (and an enormous one at that). The giant balloons that are iconic to this celebration weren’t always part of the show. At first, Macy’s borrowed animals from the Central Park zoo including elephants, tigers, camels, and more. Children weren’t keen on the idea at the time, often being frightened by the live animals in the parade, which lead to the appearance of balloons in 1927. Today, for good reason, Macy’s deflated their parade balloons before packing them away. During the first few years, however, they chose to release them. This wasn’t a problem when they were filled with air, since they would just pop after rising high enough. In 1928, Macy’s switched to helium which was supposed to slowly leak out as the balloons rose into the sky over the course of a week. The company expected that wind currents would carry them across the country, offering anyone who picked up a deflated character $100 for returning it. What actually happened was a mad dash to collect these parade balloons that cause a neighborhood wide tug of war in Long Island, a tugboat battle on the East River, and two close calls for pilots who attempted to snag balloons on the wings of their planes. Needless to say, Macy’s put an end to that tradition after a few years. From 1942 to 1944, Macy’s canceled the parade so they could donate the rubber to the United State’s efforts in World War II. All of their previous balloons were deflated and shipped off to Washington D.C. They returned in 1945 with one of the largest crowds to ever attend the parade. It also looked like the parade would be canceled in 1958 due to a helium shortage, but Macy’s teamed up with Goodyear and Traynor & Hansen Co. for a quick solution. Instead of using helium to keep the balloons up, they would fill them with regular and hang them from cranes. It worked, but it was a dismal year for the parade. Since then, the parade was only canceled one more time in 1971. Winds in the city were simply too strong to safely fly the balloons through the streets. To protect their employees and the public, Macy’s shut down the operation that year. Macy’s trains and tests their balloon pilots three times a year to ensure they can walk backwards without stumbling for 2.5 miles. Their balloonatics designs and create all of the company’s balloons from scratch, handling the entire process by hand from pencil sketches to painting and applying glitter. The level of dedication is intense, but the end result is one of the most watched celebrations in the entire country. Snoopy has appeared in the Macy’s Day Parade more than any other character in history. He isn’t the only beloved balloon, though. Ronald McDonald, Big Bird, and Spiderman trail behind by only a handful of appearances. While iconic characters like these continue to make appearances, some balloons aren’t as well received. Who could forget the Nantucket Sea Monster in 1937, or the Pinocchio with a 44-foot long bulbous nose that same year? How about the various monsters featured, like an evil dragon with no character affiliation or a piranha? 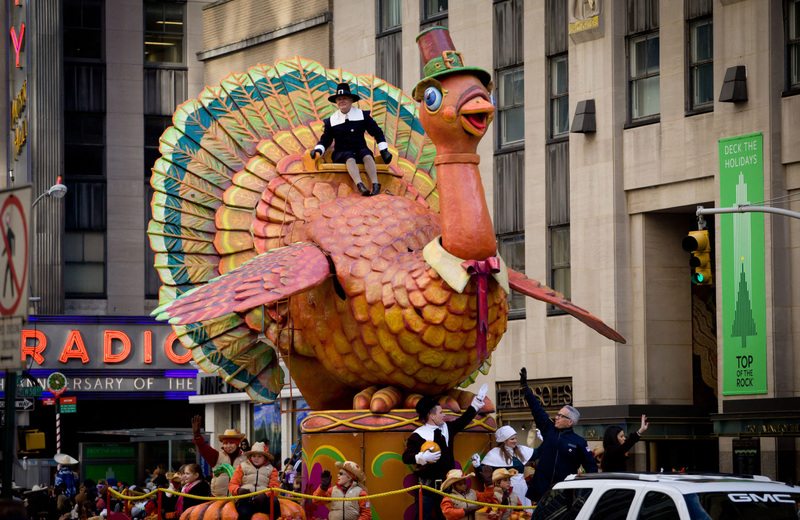 Floats like these, including a strange Eddie Cantor, didn’t exactly resonate with Thanksgiving. While not every balloon has been a success, the design team at Macy’s has significantly improved since the early days of the parade. 15 Cliff offers its residents a premier location in the Financial District accompanied with the finest in modern furnishings ahttps://www.15cliff.com/amenities)nd luxury amenities. Spacious layouts combine with top-tier finishes and community spaces that cater to your lifestyle. An on-site café, fully equipped gym, and landscaped rooftop deck are just the tip of the iceberg. Take advantage of surrounding fine dining, designer shopping, and world class entertainment just outside of your front door. These apartment homes are more than just another city address, they redefine the concept of luxury living in Manhattan. Welcome the downtown renaissance. Welcome to 15 Cliff.